Born Digital Records from the Champaign County Greenways and Trails Committee Plan and Maps, contains the Champaign County Greenways and Trails Plan, prepared by the Champaign County Regional Planning Commission. 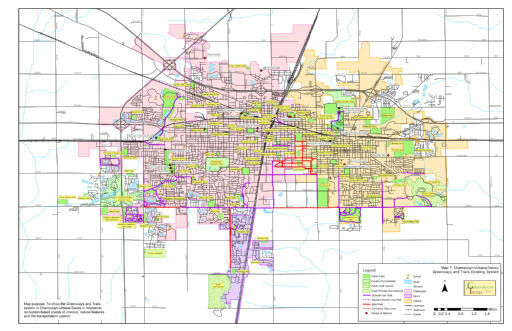 The plan includes Champaign- Urbana - Savoy greenways and trails system maps in relation to recreation-based places of interest, the transportation system and frequent traffic generators. The Champaign County Greenways and Trails Committee Plan and Maps (Born Digital Records), 2004 are managed by the University of Illinois Archives and do not feature precise descriptive information for each item. Discover their contents by browsing the folders and files. For more information, contact an archivist at illiarch@illinois.edu.